A killer targets a peaceful lakeside community, and one family is changed forever by secrets and lies. Evening Lake is idyllic, peaceful, with a close-knit community of families who have been coming to this western Massachusetts getaway for decades. Then newcomer Lacey Havnel and her daughter Bea move in. They are nothing like the well-heeled families who populate Evening Lake. Mysterious and rough around the edges, they keep to themselves. Detective Harry Jordan sees his lake home as a respite from solving crimes on the streets of Boston. The Osborne family views their cottage as a way to avoid the distractions of life—especially for Wally Osborne, a famous horror writer who seems to need the peace and quiet more than anyone. One night, Harry is walking alongside the lake when the night is rocked by an explosion: the Havnel house is engulfed in a conflagration, and young Bea is seen fleeing, hair on fire, and plunging into the lake. She survives, but her mother does not, and Harry is pulled into the investigation. Unbeknownst to the rest of the community, Diz Osborne, the youngest Osborne son, carries a weighty secret about who else he saw rowing on the lake that night. When it’s discovered that Lacey died not from the explosion but from a knife wound, it’s soon clear that a murderer is on the loose. And this murderer is poised to strike again and again. 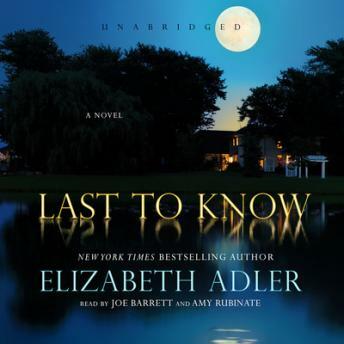 Told with Elizabeth Adler’s inimitable style, illuminating descriptions, and intricate family dynamics, Last to Know is the definition of a page-turner.